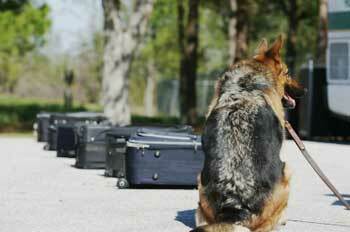 Dogs are often called upon to assist in law enforcement. Among other things, they can help detain a suspect, pursue a suspect (by tracking him), identify a suspect (by his scent), detect illegal substances (including bombs and controlled substances like illegal drugs), deter crime, protect officers, and control crowds. Testimony that a dog identified a suspect by his scent may be admissible if the techniques for scent tracking achieve acceptance and a proper foundation is provided for the admissibility during trial. Kondaurov v. Kerdasha, 271 Va. 646 (Va. 2006); People v. Willis (2004) ___ Cal.App.4th ___ , 2004 DJDAR 1010. See discussion, below. Ryan Willis was charged with the first-degree murder of his former girlfriend, Crystal Stahl. Several people witnessed Willis physically abusing Stahl while they were dating. After Stahl broke up with Willis, he told his friends that he would kill her by setting her taxicab on fire. A few weeks later, Stahl's charred body was found in her taxicab, which had been set on fire. During the trial, the state offered evidence that a bloodhound had detected Willis' scent at the crime scene. Willis objected, arguing that scent transfer unit (STU) technology was not scientifically reliable. The trial court admitted the STU evidence. Willis was convicted. The Court of Appeal affirmed the conviction but ruled that the evidence should not have been admitted. The use of new scientific techniques at trial requires proof of reliability. The dog handler who testified for the state was not a scientist and, thus, was not qualified to establish that STU was widely accepted in the scientific community. There was no proof that the handler used correct scientific procedures while employing the STU. There were also several foundational weaknesses because it is unclear how long a scent remains on objects or whether each person has a unique scent. Thus, it was held that the trial court improperly admitted the STU evidence. In October 2013, a police watchdog organization accused the Los Angeles Sheriff's Department of overusing its dogs to bite suspects, rather than to find and corner them. Worse, it was found that the overwhelming majority of the victims were black and Latino. See the National Public Radio article, In Los Angeles County, It's 'Bark and Hold' vs. 'Find and Bite', which includes the remarks of Attorney Kenneth M. Phillips. Experts agree that police use of dogs is justified as long as the dogs are maintained in their training and the handlers are supervised adequately. It is known to many, however, that many of the dogs go out of training because of handlers who like the dogs to bite people, and furthermore, that the handlers are not supervised to the extent that they should be in order to prevent people from being injured unnecessarily. See the extensive article by Alexandra Semyonova, Police dogs should be trained as officers, not equipment, published at Animals 24/7. To eliminate such problems, bite incidents should be thoroughly reviewed to determine whether the dog was necessary, the handler issued the correct commands, the dog responded correctly to the commands, and the use of force was justified. Additionally, the severity of the crime, behavior of the victim, and personal characteristics of the victim such as race and ethnicity should be tracked to determine whether dogs are used against certain people and not others. Police dogs are highly dangerous as a result of their training. They are taught a bite-and-hold technique for subduing individuals suspected of felony crimes. This bite-and-hold technique's greater applied force results in a unique spectrum of injuries, including deep puncture wounds, severe crush injuries, large tissue avulsions and lacerations, wounds necessitating surgical débridement, bony injuries ranging from cortical violations to displaced fractures, neurovascular damage, and other wounds at high risk for infection. Injuries caused by find-and-bite police dogs are the subject of many cases. See, e.g., Trammell v. Thomason, 335 Fed. Appx. 835, 836 (11th Cir. 2009) (victim underwent four operations and was hospitalized for eighteen days after police dog repeatedly bit his throat); Crenshaw v. Lister, 556 F.3d 1283, 1286 (11th Cir. 2009) (police dog bit victim 31 times) Grimes v. Yoos, 298 Fed. Appx. 916, 917 (11th Cir. 2008) (police dog bite caused victim to lose 30 percent of his arm); Miller v. Clark County, 340 F.3d 959, 961 (9th Cir. 2003) (police dog tore victim’s skin in "four places above the elbow" and "shredded" the muscles underneath); Vathekan v. Prince George’s County, 154 F.3d 173, 177 (4th Cir. 1998) (police dog bite put victim in hospital for six days and caused permanent facial disfigurement); Kopf v. Wing, 942 F.2d 265, 267 (4th Cir. 1991) (police dog "frightfully mauled" victim and caused "four scalp lacerations, a fractured skull, and a subdural hematoma"); Robinette v. Barnes, 854 F.2d 909, 911 (6th Cir. 1988) (police dog bite to victim’s neck caused death); Gibson v. City of Clarksville, 860 F. Supp. 450, 453 (M.D. Tenn. 1993) (police dog bite required victim to undergo two surgeries and skin graft). Find-and-bite police dogs are especially dangerous not only because of their training but because they tend to be larger breeds, weighing 70 to 90 pounds or more. P.C. Meade, "Police Dog and Domestic Dog Bite injuries: What are the Differences?," 37 Injury Extra 395, 399 (2006), available at sciencedirect.com. These dogs are taught to inflict forceful bites using all of their teeth. Id. The force of a trained dog’s bite is between 1,200 and 2,000 pounds per square inch. Vathekan (above) 154 F.3d at 177 n.3 (citing Douglas U. Rosenthal, Note, When K-9s Cause Chaos — An Examination of Police Dog Policies and Their Liabilities, 11 N.Y.L. Sch. J. Hum. Rts. 279, 296 (1994)). This amount of force is comparable to an automobile wheel running over a body part. Miller, 340 F.3d at 962. The special qualities and training of military dogs, and the unusual dangerousness of them, is discussed in Unleashing the Dogs of War: Using Military Working Dogs to Apprehend Enemy Combatants, Major Charles T. Kirchmaier, The Army Lawyer, Department of the Army Pamphlet 20-50-401, October 2006. 1. If the victim was not a party or participant in the acts that prompted the use of the police dog, and was not suspected of being a party or participant. 2. If the police department had not previously adopted a written policy on the necessary and appropriate use of a police dog. 1. In the apprehension or holding of a suspect where the employee has a reasonable suspicion of the suspect's involvement in criminal activity. 2. In the investigation of a crime or possible crime. 3. In the execution of a warrant. 4. In the defense of a peace officer or another person. In a case handled by Attorney Kenneth M. Phillips, for example, a tourist walking with his luggage was invited into a police car but was bitten on the hand by a police dog. No crime had been commited or was suspected of having being commited. The handler had not commanded the dog to attack but it did so anyway. Initially the city attorney asserted that the tourist was to blame for having opened the door of the police car (despite having been invited into the car). However, it was revealed through discovery that the same dog attacked a police officer 3 months later, resulting in his disability for a number of months. Phillips' client ended up winning a substantial settlement. Interestingly, after these two events the dog was not put down, but was given away. The city that bought the dog sustained big losses because this highly trained animal acquired from a German company ended up assaulting and injuring a tourist and at least one police officer. "When Evansville police attempted to arrest Jamie Becker, Officer Elfreich released his police dog under the belief that Becker was hiding in the house. However, two seconds later, Officer Elfreich discovered Becker had been descending the stairs to surrender with his hands above his head. Nonetheless, Officer Elfreich continued to allow the police dog to bite Becker, while pulling him down three steps and placing his knee on his back and handcuffing him. ... While it is unclear from the record whether Axel presented a substantial risk of serious risk bodily harm (and thus deadly force), the force was clearly at the more severe end of the force spectrum.... A jury could reasonably find such force was excessive. Further, because it was clearly established at the time of Becker's arrest that no more than minimal force was permissible to arrest a non-resisting, or passively resisting, suspect, Officer Elfreich was not entitled to qualified immunity on this record." See James Becker v. Zachary Elfreich, May 2016, no official citation at the time of this writing.